What do you do when every telescope down the row is aimed at the same object? Or worse yet, what do you aim at when there is no Moon or bright planets above the horizon? Every seasoned telescope operator has a quick repertoire of secret favorites, little known but sure-fire crowd pleasers. Sure, Saturn is awesome and you should see it through a telescope… but it’s a big universe out there. I’ve even seen clubs assign objects to individual telescopes to avoid having everyone point at the same thing, but this method is, well, boring for the scope operators themselves. Most backyard astronomers can simply look at a tube pointed at Orion and know the neighboring telescope is aimed at the Orion Nebula. What follows is our very own highly subjective (but tested in the field!) list of secret star party faves. Yes, it is mid-northern latitude-centric. It also covers a span of objects of all types, as well as a handy information chart of where in the sky to find ‘em and a few surprises. We also realize that many public star parties often take place downtown under light polluted skies, so a majority of these are brighter objects. Don’t see your favorite? Drop us a line and let us know! 12. The Double Cluster: Straddling the border of the constellations Perseus and Cassiopeia, this pair of clusters is a fine sight at low power. The technical designation of the pair is NGC 884 and NGC 869 respectively and the clusters sit about 7000 light years distant. You can just see the pair with the naked eye under suburban skies. 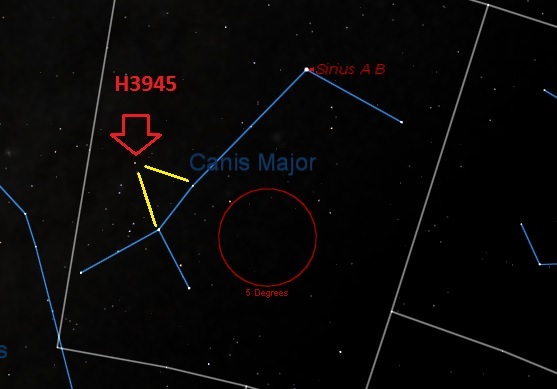 The location of Herschel 3945 in Canis Major. (Created by Author in Starry Night).